Everybody’s doing it, so why not offer a business loyalty program? If this question is the focus of discussions at your business’ meetings, it may be time to consider what type of business loyalty program will net you the results you’re looking for — and that your business needs to not only stay afloat, but to succeed. Most small businesses have a slim operating margin, and giving away free products and services typically offered with traditional loyalty programs can put that margin in flux, and greatly affect your bottom line. In general, it can be helpful to offer a loyalty card program if it’s standard in your industry. It’s hard to imagine a coffee shop that doesn’t offer some kind of free perks! 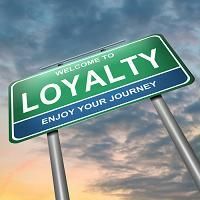 Traditional loyalty programs can also work by imposing strict time limits, and using them when a competitor offers products and services similar to yours. However, loyalty cards aren’t for every business, especially if you’re in a service industry such as credit union, mortgage, real estate or even heating and cooling. You can however put the principles of loyalty programs to work for your business, using them to drive your marketing program. It grows your customer base – And it helps you communicate with the right kind of customer, one who will buy. You see, this kind of business loyalty program builds trust between you and consumers, and helps you showcase the benefits of using your products and services. It builds your brand – Building a brand reputation takes time, and you can combine that goal alongside your efforts to communicate with potential customers. Further, the marketing series will establish you as an authority figure in the minds of recipients. It boosts your other efforts – With a defined plan, you can increase marketing consistency, grow brand recognition, and allow your sales/marketing teams to operate from one common goal. Contact Continuity Programs for more information about starting your own customized, personalized business loyalty program that will generate leads and referrals from your satisfied customers.